We decided to do some research on shaving creams, this way answering the big number of requests we received. It looks like people are enjoying our recommendations in electric razors and safety razors, and want to find out which are, according to our opinion, the best shaving creams for men on the market right now. Knowing how important using the brush is for a true wet shaver enthusiast, we selected shaving creams that can be applied using the brush. There are many top shaving creams out there, and unfortunately we had to leave many of them out of our list, as we only included those that were our favorites. We didn’t take into account mass retail products, we focused our attention on high-end smaller manufacturers. It was not easy going through this large number of shaving creams, but here are our recommendations for the best shaving creams for men. The shaving cream from Tribute Supply Co. is an excellent men’s grooming product. Yes, if you compare it to a 2$ shaving cream it can seem kind of pricey, but in reality it’s not costing you more. You only have to use a small quantity to cover the entire face, so ultimately you’re getting more value for the buck. You can either use it with a shaving brush or apply it by hand. We had some concerns applying it by hand, thinking that you’ll have to use much more of it this way. Turns out you don’t. Tribute Supply Co. has been one of the dominating brands in the high-end shaving cream market for years, and still proves to be on top. Jack Black is another big name in the industry. The Supreme Cream is nothing less than what its name implies. Jack Black says their cream provides 3 lathers: for protection, hydration and comfort. Although, at first thinking that this was just for marketing, it seems that this shaving cream offers everything it promises. You might think the can is a bit small but don’t get mislead by this because a small dab will produce a lot of lather. And as mentioned in the beginning, you can apply it with or without a shaving brush. 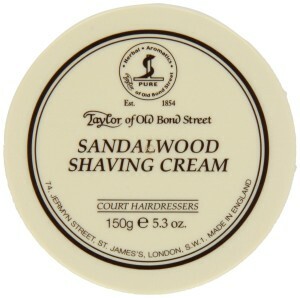 We haven’t been using the sandalwood shaving cream from Taylor of Bond Street until recently, but it has made quite an impression. It’s not only one of the names with a tradition in shaving products since 1854, but it also does a really great job. Again, you can use with a brush if you want, but you can obtain a really rich lather using your hands. It will also leave your face smelling great, feeling soft and hydrated. 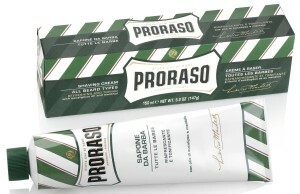 This shaving cream kind of makes you want to go classic and use a straight razor. Honestly, we didn’t have any form of experience with The Body Shop for Men before trying this product out. It made a great first impression. One of the first things that you will notice when using this shaving cream, is how extensive the action time is. If you missed a spot, you only have to splash some water on and the problem will be solved, just like that. Comparably with the other products we included in this list, just a small dab of it will suffice to get the job done. 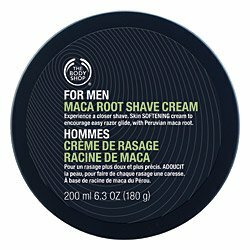 Although such a high quality shaving cream, The Body Shop for Men is priced about 25% lower than other high-end products. Although this is the least expensive of the shaving creams we reviewed for this post, don’t let that make you think that it’s of a lower quality than the others. We have tried out different Proraso products over time, and can only say good things about them. They pride themselves with manufacturing high-quality shaving products, and honestly we can’t take that away from them. They focused on bringing on the market probably the best value for money high-end shaving cream. The tube though is quite small, compared to the other products included here but it’s still an economically wise choice. Thanks to the eucalyptus and menthol, it leaves your skin moisturized, feeling really healthy. All in all a great product. Next post: Which is the Best Shaving Brush?